Before purchasing this set please note it is now included in a my POLAR EXPRESS BUNDLE. AND it is also sold in my HUGE MEGA BUNDLE OF DECEMBER MEASUREMENT CENTERS. The MEGA BUNDLE includes; 2 sets of Polar Express Cards, 2 sets of Christmas Holiday cards, 2 sets of Nativity cards, 1 set of Twelve Days of Christmas cards, 1 set of Toy Factory cards, 1 set of Gingerbread Man Story cards, and 1 set of Nutcracker Ballet cards. Keep your stations fresh with a new DECEMBER Measurement station! Add some FUN December Math practice to your center rotations! This MEGA pack includes all images from original smaller Polar Express Set and 11 additional images to measure, so 22 cards in all on 12 pages with a recording sheet. 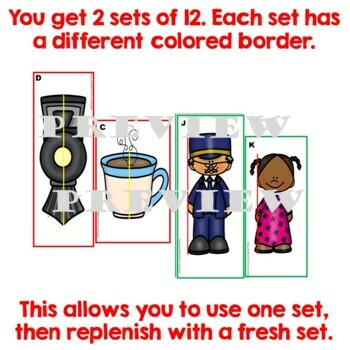 The sets are differentiated by the border color, one set green borders the other red. When students are recording work on the answer paper they can circle which set they used, red or green. 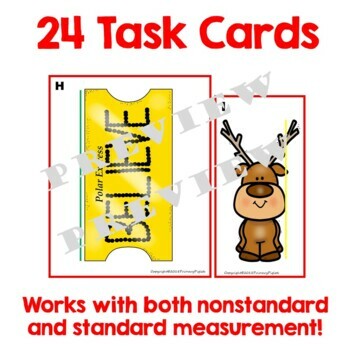 Task Cards include images shown on cover page. This MEGA set has 2 sets, green set & red set. 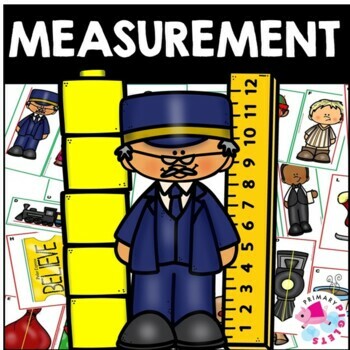 Each set has 11 colorful measurement cards (on 6 pages). Each card is labeled "A, B, C, etc.." and a recording page is given to match. The recording page allows for the student to fill in the unit of measure they are working with, unifix cubes, cm. cubes, beans, paperclips, inches, centimeters, etc... so it is very open ended to suit the needs of your curriculum and students abilities. You can print the recording sheet double sided (early finishers) and ask them to measure using 2 different units of measure (I was 1st grade so it was nonstandard measurement).